These Fish sometimes grow to the Length of three Feet. This was in shape not unlike a rolling Pin the biggest Part of it being the Middle, growing tapering towards the Head and Tail; the Eye large, with a light coloured Iris encirculed with blue; two solid white Bones covered with a thin Skin formed each Mandible, in which were inserted six Teeth, two in the upper and four in the under Jaw, which was longer than the upper. On the hind Part of the Back grows a pretty long stiff Finn, opposite to which; under the Belly grows another of the like Finns, and two behind the Gills; the Tail-finn was long, stiff and bony, serrated at the End and when spread very wide. The Structure of this Fish as well as it's Marks are very singular and different from any other. Yet the most remarkable Part of it is a tapering sharp-pointed Bone, growing from the Top of the Back, a little behind the Eyes, which it can raise and point backward and forward; at his Pleasure, and when laid along on it's Back reaches to the Finn; this Bone is very brittle and easily broke by which one would think it not so defensive a Weapon as otherwise Nature seems to have designed it for. 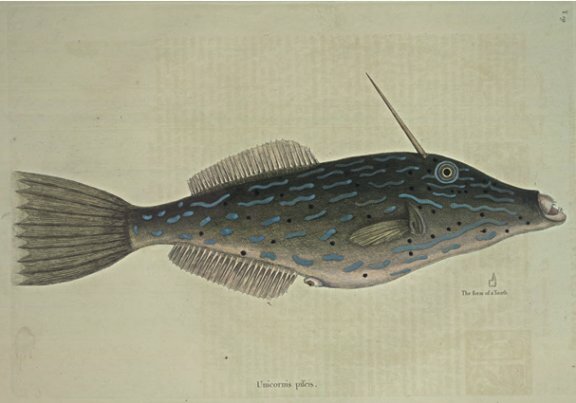 A brown Olive-coloured Skin without Scales covered the whole Fish, with many blue waved Lines of different Lengths some long ones resembling Worms, and others Maggots, between which were sprinkled many round black Patches, The Guts were full of Corallium porosum, small Shells and other coralline S ubstances, most of which was Ground very small; which by the Strength and Hardness of it's Jaws Nature has enabled it to perform. These Fish are not eat, being accounted poisonus. They most frequent those Seas amongst the Bahama Islands, where the Corals are most plentiful.